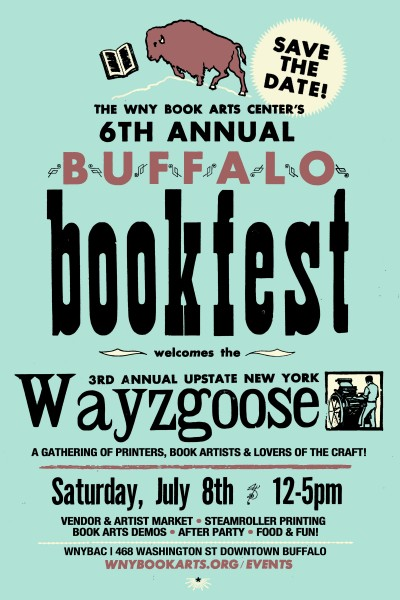 Don't miss the 6th Annual Buffalo BookFest, as we welcome the 3rd Annual Upstate Wayzgoose, a gathering of printers, book artists, and lovers of the craft! WNYBAC’s Buffalo BookFest is a day-long festival dedicated to printing and the book arts, with free hands-on demos all day, for all ages. This year we’re making the event bigger and better, with the addition of Book Arts vendors from the Upstate NY region, as a part of the Wayzgoose arm of the event. This event is FREE and open to the public, taking place inside both floors of the Book Arts Center, stretching across the newly opened Mohawk Street, and spilling into the adjacent parking lot–you won’t want to miss this festival! Free Parking on adjacent streets or take the Metro Rail down! – Paid lots next door. For more information and vendor applications please visit www.wnybookarts.org/events, call us at 716-348-1430 or visit us in the store Wednesday-Saturday 12-6pm.